The last of the finals saw England take the final gold medal of the games with Megan Parker performing beautifully to take the title. Starting with a lovely split jump full, Megan then tumbled a triple twist with excellent form, just a jump back on landing from being a tiny bit under rotated when she hit the floor. Change to ring, then I have no idea what happened with the feed, as it suddenly stopped and I had to scrabble with my wrong hand on the mouse to get it going again! Second tumble double tuck, she’ll have taken a deduction for her chest position on landing, but her feet didn’t move. Megan made the Memmel spin, a little knee bend on the supporting leg, and she was off vertical coming out of it, but held the relevé all the way through. An easy stuck double twist to finish, and she was cleanly through for 13.40. Megan works beautifully on this piece, committing herself to her performance and choreography, the same lovely lines she shows on beam, and the same attention to form and detail. Maisie Methuen took the silver with a routine that she’s performing really well now, and is a pleasure to watch. I like that she’s doing something a little different in opening with her leap series, the change to ring, change three quarters I’m guessing is heading toward a full for the D as it’s nearly there, both leaps are performed well. High double pike with a small shuffle back to open, stuck double tuck second tumble. Lovely tour jeté half, then she tried the double spin in attitude, but just fell out of it, although did manage to squeeze the back spin out with a bit of a hop round. Handspring straight front full, then finishing with a beautiful straight front double twist with legs locked together, and not a hint of a movement on landing. 13.10, and another routine focused on performance and choreography which is fantastic to see from so many of the top level junior gymnasts coming through. Latalia Bevan took yet another medal claiming the bronze on floor, and moving up a place from qualification. Starting with a split full, then tumbling double pike, a little underrotated causing her to pitch forward and take a step. Clean handspring straight front full twist with a hop forward second tumble, then beautiful fouetté turns completely under control. I love Latalia’s quiet calm style on floor, she draws the attention in as opposed to projecting outward, and it’s beautifully effective. Leap series next, again with a lovely touch to the choreography where she completes a full turn within the dance between the change to ring, and the change half. Not necessary, but it’s extra touches like this that make a routine stand out and be remembered. beautiful Y scale spin, and a tidy back one and a half to straight front which is an upgrade from the tuck front earlier in the year. Double twist to finish, and a great routine, Latalia actually also performed a two and a half twist second tumble earlier in the year, so is experimenting with different tumbles. 13.050, and the end of a very successful competition. There’s also a lovely interview with Latalia here following her successful championships. Sophie Scott also opened with a double pike, more length than height from the take off causing it to be a little short with a hop forward. Tidy one and a half to straight front second tumble, good form with a small hop on landing. Nice to see the use of an Onodi instead of the many free walkovers/free cartwheels we see, Sophie uses a lot of the floor for her leap sequence, hitting good positions on the change to ring, and tour jeté half. She fell a little out of vertical on the double spin, but kept it in relevé, change leg quarter in to the corner, then finished with a lovely full twisting straight front into fully controlled stag leap to finish. A nice new routine from Sophie which really suites her style, and she’s growing into the performance well. 13.00. Emily Thomas didn’t compete AA, but did well enough to qualify for the floor final from the team event. Starting with a change full not quite hitting the split position, Emily opened her tumbling with a high and impressive whip double tuck. A very tidy straight front to straight front full twist followed, then leap sequence of change leg through to tour jeté half. Change 3/4, then double spin which Emily completed well keeping it on the axis, but could have done with just a little more extension through the foot. Finishing with a one and a half straight front with a bounce out, Emily is clearly a powerful floor worker, and her routine is bouncy and energetic to suit this. 12.850. Taeja James has a beautiful technique on the first half of her flick, long and stretched, but she also snaps up a little long at the moment for the tumbles she’s performing which can affect the set sending her traveling quite far for such a tiny gymnast. My guess is that she has been working harder tumbles in training, so adjusting her takeoff position, which then has affected her when going back to easier tumbles for her, as looking back to this time last year her snap was shorter, and lift more vertical. On her opening tumble she didn’t snap up short enough, and took off longer than she’d have wished causing her double pike to travel, and taking her to the edge, then out of the area on landing. Second tumble two and a half twist, again quite long, but kept in bounds. Lovely hop full through to tour jeté half easily round and very clean. Change half into the corner, and a little bobble out of it which she disguised well, then tidy and well performed one and a half to straight front, just a small scuttle back. Taeja had a bit of an issue on the double spin with leg above horizontal, she lost the vertical position about three quarters of the way round, and dropped the leg, she did make it through the back spin out of it though. Double twist with a step to finish, and 12.20 today. Not her best championships at this school games, but good to see her back in competition. Teaja is a huge talent, and I look forward to seeing her back for the Espoir Championships in December. 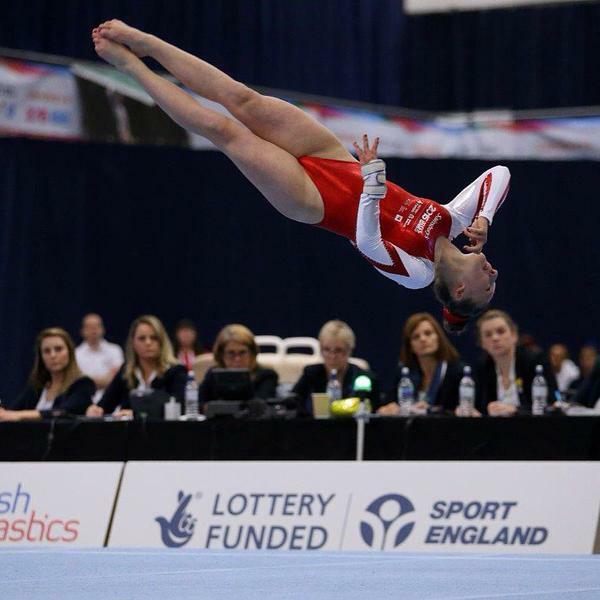 Louise McColgan came in to the final in first place, and as fans of this young gymnast will know, she would have been a good bet to take the title. Known for her beautiful expressive performances, and high tumbling, there is a reason that many people outside of Scotland and Great Britain are aware of Louise, and that is because for several years now she has been putting in to her floor routines what many miss from the sport; the A from WAG, artistry in abundance. It wasn’t to be today, Louise had watered down her tumbling for this event, taking out the piked full in, and the triple twist opening tumbles, and replacing with a double tuck and a two and a half twist. Unfortunately for Louise she had to put her hands down on the double tuck which was absolutely huge in height, but she just didn’t pull the rotation all the way round. Something I’m sure she’ll be kicking herself abut as it’s an easy tumble for her. It happens, Simone Biles touched down on a what is a simple tucked full in for her just a few weeks ago. There was a new leap in the the dance passage, a change to ring this time, then the tour jeté half, both hitting good split positions. More upgrades in the spins, a back double to Memmel, ambitious and impressive. Ring jump full turn, then a big double pike that she pulled a little hard on causing her to bounce back. Split jump full to finish, and despite the problems, Louise sold the routine with her customary style, projection and flair. Obviously she will be disappointed with the routine, but she’ll be back, and when the tumbles go back in, with the new dance elements she’ll has one of the highest junior D scores, and on her better days is very very clean. 11.750 today, but so much more to come. Casey Jo Bell opened with a big double pike, but struggled to bring the landing under control, and bounced back, then out of the area. Much better on the double tuck, just a small pace on landing here. Switch half, then a very well controlled two and a half spin, which I’m sure will soon be a lovely triple for the higher value. Just a full twist for her third tumble, but nicely performed, again taking a deduction for the bounce back though. Change leg, to change leg 1/4, then finishing with a straight front full twist for a good end to her routine and a positive final performance to her championships. A lively routine to match the music, 11.70 for Casey. September 9, 2015 in Reports.